A Limited Edition fine art print by Peter Deighan. 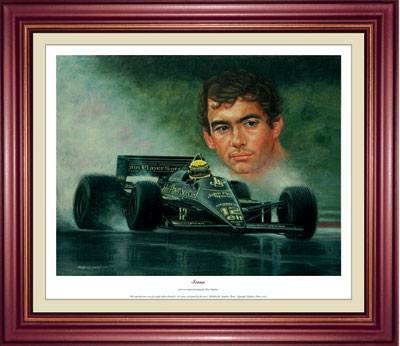 A magnificent portrait of Ayrton Senna, probably the greatest ever Formula One driver and his supreme JPS car. His ability and determination both contributed to making him the most feared and respected driver on the Formula 1 circuit. 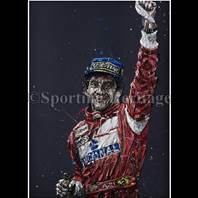 World champion three times in 1988,1990 and 1991, a fitting testament to his sensational talents. 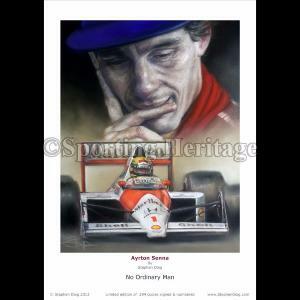 He was tragically killed in a race in 1994, robbing Formula 1 of undoubtedly its greatest son. Gone but never to be forgotten! Published in a single limited edition of 850 worldwide, each image measures 485mm x 385mm and has been individually numbered and signed by the artist. Please note, our price is for the unframed, limited edition print.